Jake and his buddies are over being bullied by the thugs at the housing projects he calls home. That's why Jake decides to play the goons at their own game by creating a fake gangster, the Big Baresi. But before long, the imaginary mobster seems to have taken on a life of his own! The stakes are raised when a stash of stolen diamonds goes missing. From behind the wheel of an ice cream van, Jake's got to pull off the ultimate con--while managing to keep the mint chocolate chip from a meltdown. Because, as the Big Baresi knows, revenge is a dish best served cold. 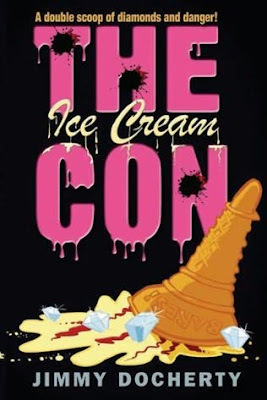 The Ice Cream Con is all about a boy called Jake who lives in a rough area called the Lochrannoch Estate which is home to quite a few criminals and gangsters. Jake lives with his ill grandmother in a small flat, and they don't have much money. Jake's grandmother never sets foot outside the house because she's too scared, so one day she gives Jake £20 and asks him to go and get her some groceries but Jake is mugged on the way there. He returns home with no money and no food - and that's where the trouble starts. Jake is so angry with the muggers that he gets his friends (Harvey, Aidan and Sofia) to help him get revenge. Revenge that includes a made up gangster called Baresi, which leads them into all kinds of trouble. This book was very funny, the funniest characters being Harvey (who is obsessed with ice cream) and Jake's grandmother who takes pills to help with her illness - the side effect makes her fart at the most inappropriate times! This book is one of the most hilarious books I've ever read, and I was really sad when I got to page 188 - the end. Some of it was a bit complicated I think, and some of it wasn't very realistic, but other than that I really liked it! I don't know if there is a sequel or not, but if there is I would love to read it. The author, Jimmy Docherty, has written this fantastically - he knows how to keep the reader on the edge of their seat, while in a fit of giggles! I'd recommend this book for kids ages 10+, and I give it a rating of 5/5. It sounds like loads of fun! Thanks for the great review. Your so lucky to have this! I WANT IT!